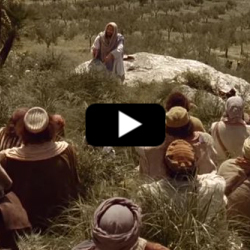 In this video about Jesus, we learn about the least of these. This comes from the scripture that says, “Inasmuch as ye have done it unto the least of these my brethren, ye have done it unto me” (Matthew 25:40). This means that we should not only study the scriptures, say our prayers, go to church and so forth, but one of the most important things we can to in life is to serve others - the least of these; we should help the needy, the hungry, the thirsty and visit the afflicted. As we serve others, it is the same as though we had served Jesus. Here’s how Jesus taught this concept in this scripture. He started by mentioning the Kingdom of Heaven, something He often mentioned, then he compared us, in a parable, to sheep and goats. He said the sheep (the good) would be on His right hand and the evil (the goats) would be on His left hand. He then talked about about the righteous who gave Him food, clothed Him, gave Him drink and visited Him. The righteous then asked - when did we do these things unto you? Jesus said as they did those things unto others, they did them unto Him. If any of us do kind things unto others, we do them to Jesus. Then Jesus talked more about the evil of the world - how they didn’t help those in need, and He said that since they didn’t help others, they were not serving Jesus. Now, when we serve others, we don’t always have to do large things in public view. Much of the service we can render to mankind that may make the biggest difference in the world may be within the walls of our own homes with our families. We can teach our children about God, help them with homework, clothe them, feed them and comfort them when they’re sad or lonely. As we do these things, we are serving God and helping others. Here’s a challenge - spend a little less time thinking about ourselves, watching TV and surfing the internet and spend more time serving our families and loving our neighbor as ourselves and making a difference in the world.